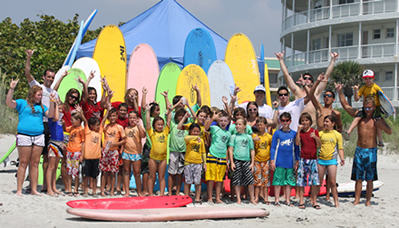 Nex Generation Surfing School is looking for sponsors interested in supporting our students through your contribution. This is a great way to advertise and promote your business and/or orginization while contibuting to the community. Your Logo will appear on over 500 hundred rashguards that will be worn by our students during camps and lessons and given to the students who will continue to wear them throughout the year throughout central Florida. Your Logo will be printed on our sponsor section of our t-shirts, distributed each week to our students. Rack Cards - Each Year Nex Generation Surfing School prints 50,000 rack cards to be distributed in the community. Your logo will be included in the sponsor section of our Rack Cards and seen by thousands! Each week our students receive take home/goodie bags filled with coupons and advertisements of local businesses and orginizations that support our surfing school. This gives businesses and orginations again, another opportunity to get your name out there and to generate more business. or to begin the process by filling out the form below.